Wearing sandals in Alaska | Turning my world upside down! We woke up this morning to blue skies and sunshine. Well rested, we packed up quietly and snuck out of the campground so as not to wake the neighbours who seemed to still be asleep. Besides, we were excited to see the bears and the glacier. We had driven up to Fish Creek the day before, but only saw one bear. It was a black bear that came quickly into the creek, grabbed a fish and disappeared back into the bush to eat it. We never even had time to get our cameras in focus. But today was a different story. We paid our $5 entry into the boardwalk which is run by the US Parks and waited. But we had missed the earlier feeding by a few minutes. Tough luck! Ok, we decided we’d drive up to the glacier only Leon realized he forgot to fill up on gas. So we figured we had better drive over to Canada to get some. I can’t think of anytime in my history when anyone has made that statement. Gas is always cheaper in the US than Canada. But Hyder, Alaska doesn’t have many services anymore, so gas can only be purchased in Stewart, BC. We even tried to get a cup of coffee in Hyder, but nothing was open until 11am. It was an amazing sight indeed and well worth the drive. On our way back down, we figured we’d check out the bears again and this time we were rewarded with a very long look at a grizzly fishing and dining and strutting for the paparazzi. What a sight!!! We made a last stop in Hyder where I purchased a souvenir fleece vest and drove back to Stewart to make lunch. I guess we must have been too excited because lunch consisted of a large ginger cookie for me and a lemon muffin for Leon. We sat outside the bakery and watched a caravan of 20 odd RVs make their way to their campground. I sure hope they weren’t planning to drive to the glacier… Actually, they usually get a bus to take them up there. It’s a different lifestyle. We drove back south towards Smithers, stopping to get more pictures of Bear River Glacier in the sun this time. I took a picture of Leon and Roadie against the mountains so you can get an idea of how large and high the area was. 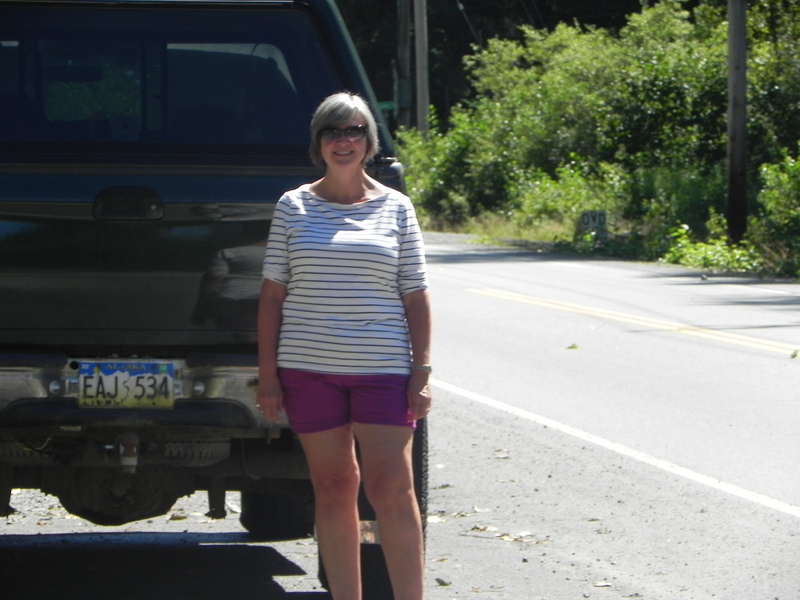 A black bear walked along the road for quite some time but we were already too jaded to take out our cameras. Actually, you get to a point where you enjoy just looking with the naked eye so much more than looking through the lens of a camera. 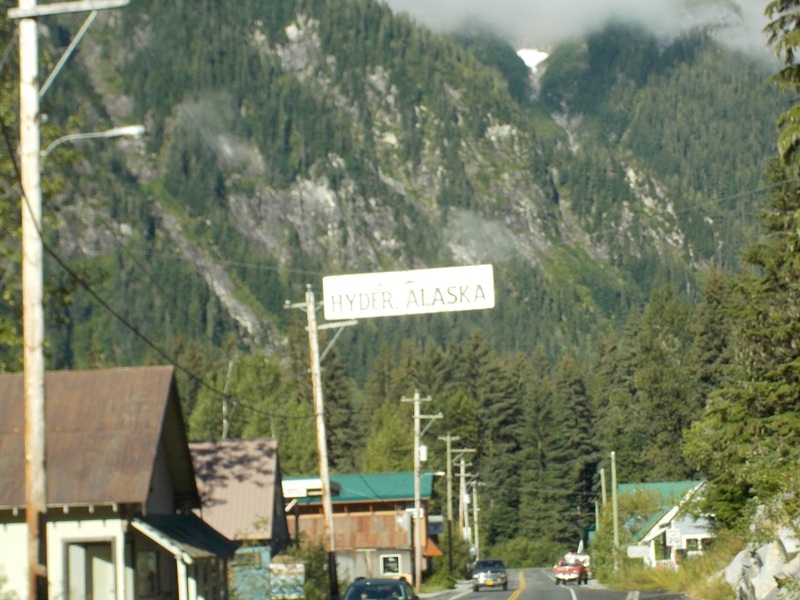 The Hyder, AK area is a different type of area to visit. Glad to read your blog again, I was starting to think you were lost in the wildness for good!